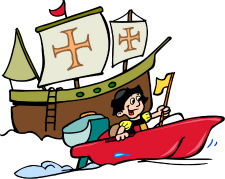 "In fourteen hundred and ninety-two, Columbus sailed the ocean blue"
Join Today! check it out! 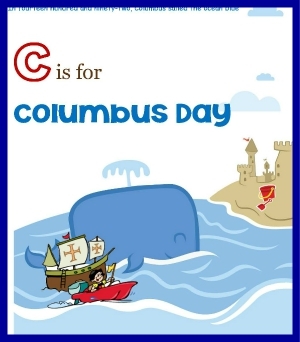 On October 10th, we will celebrate Columbus Day. Columbus Day is a holiday that is celebrated in many countries in the Americas, commemorating the date of Christopher Columbus arrival in the New World on October 12, 1492. Christopher Columbus (1451-1506), Italian-born Spanish navigator who sailed west across the Atlantic Ocean in search of a route to Asia but achieved fame by making landfall in the Americas instead. On October 12, 1492, two worlds unknown to each other met for the first time on a small island in the Caribbean Sea. While on a voyage for Spain in search of a direct sea route from Europe to Asia, Christopher Columbus unintentionally encountered the Americas. However, in four separate voyages to the Caribbean from 1492 to 1504, he remained convinced that he had found the lands that Marco Polo reached in his overland travels to China at the end of the 13th century. To Columbus it was only a matter of time before a passage was found through the Caribbean islands to the fabled cities of Asia. Build a Boat & Other Activities! Creative ideas, activities, contests, recipe fun and MORE in every issue!